Have you ever tried to do an online search for your site and it was nowhere to be found? There’s this misconception that search engines will magically find your site and make it visible for all to see. Unfortunately, giving your site a high ranking on search engines requires a bit of work. The good news is that people are searching! Between Google, Bing, Yahoo and so on, you can have answers to anything you want to know. If you’re like us you are probably on google multiple times a day asking anything from directions to the nearest coffee shop to reviews on the latest movies. Got a question? Google it! The purpose of this blog is to help you be the answer! Well, maybe not you specifically, but your website! Let’s say you have an online shop that sells handmade backpacks. When people do a search for handmade backpacks how cool would it be if your site popped up guiding new customers directly to your online store?? Below we have provided helpful tips and resources for bumping your ranking on search engines. Cheers! We would like to begin by giving a general idea of what SEO is all about. Search engines work by crawling the web and creating an index of everything it finds. This index then provides its search engine with data to analyze and rank based on content of the sites (and many other factors) to then return what it considers “most relevant” to the term you searched for. What is considered most relevant is based on a number of different (and in some ways secret) indicators. We say secret because it’s not really public exactly how search engines determine what is most relevant. One of the main reasons for this is spam. If google or any search engine explained exactly how its algorithms worked for what it shows when you search for things then spammers could use that and you would never find anything helpful or relevant when you searched. So take a minute and ponder how ingenious the search engines are that they are able to sift through so much data and, in most cases, find you what you’re looking for. It’s a very complex and amazing thing. Now the goal for us is to catch these web crawlers attention with a site that the search engine analytics will “think” users will want to see. This is were Search Engine Optimization (SEO) comes in. You want to make your site look the best it can in the eyes of these robot crawlers. You also want to make sure that the people and search terms you are trying to target are the focus of your site. SEO helps you accomplish these goals. Consider your target audience and forget for a second about the robot crawlers that you’re wanting to get the attention of. What would that audience want to find? Would they want to find your site or someone else’s? When playing the game of search engines this is a very important thing to consider. Search engines try to deliver what people want. Your goal is to be the site that people want to find. It seems like simple advice, right? However, many start with trying to get the site they have into searches without taking a hard look at the real target audience for their site. Let’s look back at our first example of a handmade backpack store trying to get more natural traffic through searches. If someone types in “backpack” they are going to get results for Amazon, eBay and the like. Unless you are a large company, you’re not trying to compete with those because the term is too vague. Amazon carries thousands of styles of backpacks and more than likely you don’t. You’re probably not going to be the best result for “backpack” because while you carry backpacks, your product is more unique and less broad. Your site is not for the vague term “backpacks” but really for “handmade leather backpacks” and they are all hand-stitched in Palm Springs, California. So a more realistic search term you might be wanting to target is “handmade leather backpacks” or “California handmade leather backpacks.” Or perhaps it’s your process that makes you unique and thus creates a specific audience. For instance, how you treat the leather for your backpacks or the exact type of leather you use or the exact purpose that your backpacks are for. Whether they’re for the rugged outdoors or the hip intercity, you have to build an SEO plan with an audience in mind. Create search terms that not only make sense for you but also the people you want to attract. Take a moment then to write down five things about your site that make it unique or special. Look at your blog posts or shop products and really consider what it is that makes your site stand out. Next, start writing down search terms that naturally come to mind when searching for a site that does what you do. Pretend there already is a site like yours and you wanted to find it. What searches would you try? Now go and ask as many people as you can the same thing. Come up with a list of obvious, natural, and simple search terms that people would use to find a site like yours. Not only do you now have a target for your SEO, but we’ve also go you thinking in terms of a target audience. There are tons of “tips” and “meta content” and “keyword” this and “schema” that, but in the end, content is king. We’re not talking about filling your site with empty words that just take up space. We’re talking about having rich, readable and interesting content. There’s no shortcut for it. Content is the single thing that gives your site life. Now that you have thought through search terms and determined what makes your site unique, the next step is to make your site become the very site that people want to find. Put yourself in the shoes of those potential searchers and think through what it is that they’re looking for. What kind of content do you want? Are there certain types of images you’re looking for? What questions do you want to be answered? Is there an emotion or an understanding that you are looking for? Find out what it is that you want your readers to feel and see when they come across your site in a search. Write down a list of all the possible questions that you might have as the searcher. Now make sure your content matches. Ask others friends and family, and if you have customers ask them as well. Gather as much information about what it is people want to find when searching for your search terms. Build that site! Search using those terms and take note of what sites show, what they are doing well and what they aren’t doing well. Think of ways to make your site’s content and layout stand out above the other sites you find. If content is King then links to your site are Queen. It’s not enough that search engine bots can read your site and know what it’s about. Search engines place a higher value on sites that have more incoming links to the site. Meaning the more people talking about your site and linking to your site the better your ranking will be. And it’s worth noting that a link from popular already well-established sites are more important than links from sites that search engines rank poorly. So think of each link as a validation of sorts for your site. So how do you get incoming links from other highly ranked sites? For businesses, the most basic place to start is business directories. For example; Google, Yahoo, Bing, Yellow Pages, Yelp, etc. Make an account on each site, verify you are the correct person and get your link listed. Next, think social networks. Create accounts and start posting making sure with each post that you’re linking back to your site. And expand the social networks you use. We all know about Facebook, Twitter, Instagram, but think outside of those. Consider Tumblr, Reddit, Bloglovin, etc. There are thousands so you can take it as far as you want. We don’t suggest you start with everyone, but we do think expanding outside of what you are using is a good start. Find sites that you can link to and that will link back to you. This takes more work but can be the most valuable links you build. Not to mention it can open up tons of other opportunities for your site. Contact sites that are complementary to your own where both can benefit from a partnership of sorts. Be willing to give more as you are the one contacting. This can look like posting a blog about them, or interviewing them for your blog or saying nice things about them on social media. Make those connections and it can open the door for many mutually beneficial connections. Whatever your site is about, connect with people talking about the very things that your site is targeting. Use online forums, social media, and even other sites to comment where you see people are talking about the things that you or your brand cares about. By doing this you will find material to blog about as well as places where you can post links to your site to add to or create a new conversation. This isn’t a complete list, but the last thing we’ll mention here is to consider advertisement. Whether you pay or exchange goods for a review or blog from a site, or you simply pay for other types of ads; this can increase links and traffic to your site and improve your SEO. As more people find out about you and start linking to you themselves your ranking will go up. There are several SEO plugins out there for WordPress, but we personally think Yoast is pretty legit. As you would with any other plugin, download and install it into your site. With Yoast, you can be as extensive or basic as you want. We are going to go over some of the major settings we find important, but if you’re wanting to dig deeper check out this guide. Permalinks determine the way your URL reads which is not just important to your readers but also to search engines. You can access your permalinks settings from Settings > Permalinks. We recommend changing your Common Settings permalinks to Post Name. Another thing you will want to do is set your preferred domain in the Google Search Counsel. This is where Google stores your search engine optimization information about your website. You can set that up here. To learn more about Google Search Counsel see here. Properly and efficiently titling your pages is crucial. A page title is the first thing your readers will see upon entering a page. More importantly, it is one of the most crucial factors in the search results ranking of your page. Something to really pay attention to is the location of your keywords. SEO is looking for keywords within the first couple sentences of your page, and so are your readers. If the keywords are up top for all to see, your page is much more likely to get clicked. Check out this post to learn tips on choosing optimal keywords. Assuming by this point you have Yoast SEO installed and activated on your site, you should see a Yoast SEO tab in the backend of all your posts and pages. Within this tab, you will find a readability analysis on your page. You will also find settings to change the display of your titles, descriptions, and images when the page is shared on facebook or twitter. This tab also provides an analysis for your SEO on that page or post. You will find tips for enhancing your SEO, and also options for you to set the SEO title, slug, meta description and focus keyword. Search engines can’t really “see” images yet. So to help them understand and connect your content together you need to provide “alt” text that describes your images. This means when you upload an image in WordPress you fill in the box for title and alt text. Believe it or not, speed can play a huge role in your site’s SEO. The number of pages that search engines will browse on your site each day is dependent on how fast your site loads. Check out our Need for Speed post on speeding up your WordPress site. As we said above, content is king. We mean it! Be sure that your text flows and makes sense. No one likes run-on sentences, and search engines are no exception. Try to really break up your text with rich headings that grab the attention of both readers and search engines. Think of what it is that you’re trying to say, then strategically paint that picture. Remember your target audience! You’re not going to capture the attention of the entire world, but you can capture the attention of some if you truly focus on who that “some” is and what it is that they want to find. For a brief overview, every page should have only one h1 tag, but for h2, h3, h4 and h5 tags you can use more than one. So use where appropriate starting with overall content themes being h2 and really specific paragraphs or highlights being h5. Schema is mostly built into the code of your site (all KadenceThemes themes support schema markup) and this allows search engines to pull “rich snippets” from your site to be shown in searches (see image below). This is really useful to draw attention to and make your pages stand out in a search result. In really basic terms, while search engines are indexing your site the schema markup gives the search engines a better context for what your content means. 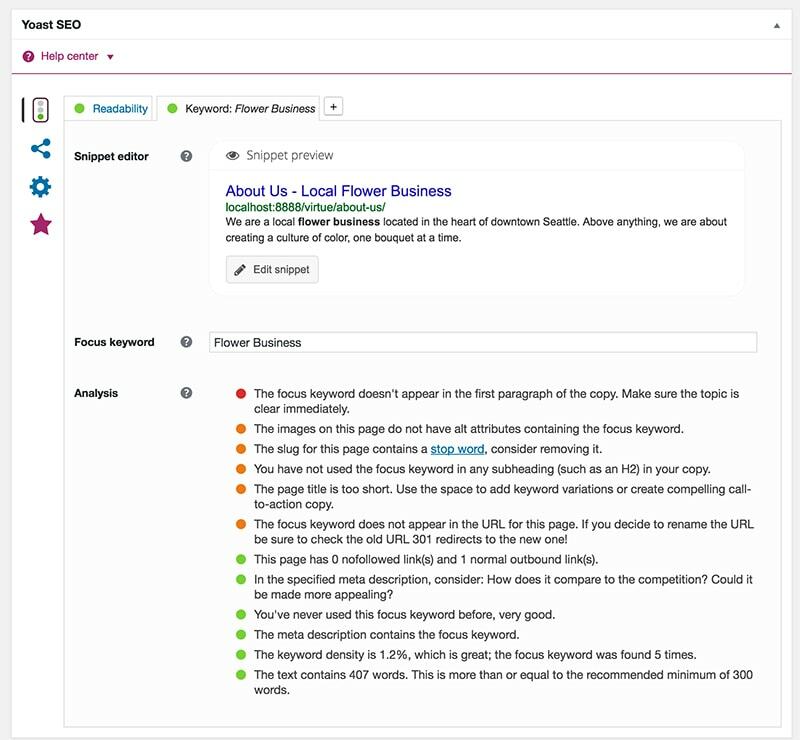 For example, schema can tell search engines what part of the content of your page is the site header and what part is the main content, and if that main content is a blog post or a product and if a product what the price is and its reviews all based on the micro formatting built into the code. We don’t mention this as something you need to do unless you’re not using a Kadence Themes theme. And if not you should make sure your theme is using the best practices with schema markup. 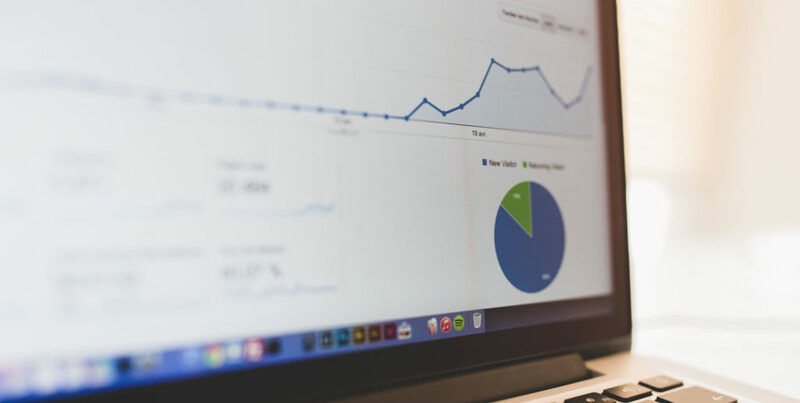 Now that you have a site that is more optimized, it is equally as important that you track your site traffic and work to continually optimize what you can. While a full article on analytics is needed to truly cover all that you can do, that is for another day. The important thing is to get your site set up to have tracking. I strongly suggest using Google Analytics. As we said at the beginning, this is a basic guideline to get you started. When it comes to search engine optimization you can be as complex and detailed as you want. For the best outcomes we encourage you to really research and find out what works best for you and your site based on the market it’s in and the target it’s trying to reach. Best of luck!